Conservatories: beautiful and desirable but somewhat impractical part of the house? Discuss. Older conservatories in particular get a very bad rap: often draughty and cold in winter and too hot to spend time in during summer, plus they need lots of cleaning and maintenance. But if you're starting from scratch on building a conservatory, what would you like to include in the design. 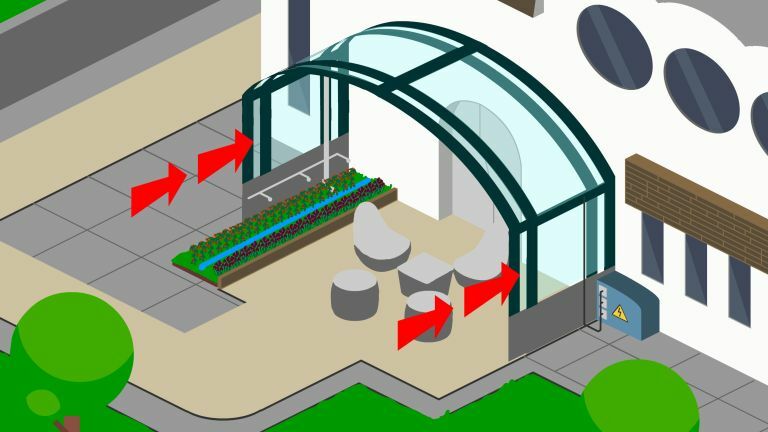 How about if your conservatory could feature transparent solar panels, collect rain water, and clean itself? These are some of the features that have been proposed by window furnishing experts Thomas Sanderson as part of their research into the energy-saving and eco-friendly possibilities of future conservatory design. Their Conservatory of the Future would (one day) feature a retractable roof that could transform the space into an outdoor terrace in the summer; the glass would be made entirely of transparent solar panels, making the structure a source of power for your home; the conservatory would enable rainwater collection, which could reduce mains water usage by a proposed 70 per cent; and the glass would be self-cleaning feature, thanks to a titanium dioxide coating for the glass, which reacts when it comes in contact with sunlight to break down dirt which is then washed away when it rains (so, the self-cleaning glass we already know and love, then). The Conservatory of the Future is still in the early stages of development, but watch this space for further news on its progress.